Isabel Sánchez Vegara, illus. Brosmind, London: Frances Lincoln, hb, 978 1 7860 3733 6, £9.99, 2019, 32 pp. Isabel Sánchez Vegara, illus. Matt Hunt, London: Frances Lincoln, hb, 978 1 7860 3732 9, £9.99, 2019, 32 pp. 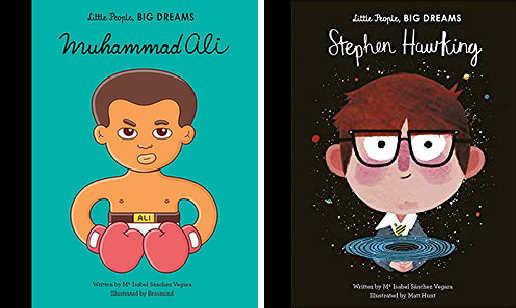 These two Frances Lincoln books are part of a series entitled Little People, BIG DREAMS. They contain brief and lavishly illustrated biographies aimed at readers aged 6 to 10. Both Muhammad Ali as a result of his boxing injuries and Stephen Hawking as a result of illness became disabled. One of the merits of these books is to demonstrate to young readers that disabled people can still achieve success. One of Hunt’s illustrations shows Hawking with one of his sons climbing on the back of his wheelchair. Disability does not preclude family fun. The illustrations to the Ali book are deliberately primitive, intended to echo the visual style of a comic book about a champion boxer. Both the subjects of these books achieved huge success and an international following in their very different areas of endeavour. Ali became the most charismatic boxing hero of his time, despite a propensity for self-aggrandisement and his refusal to join his country’s armed forces, seen at the time as cowardice but now regarded as a badge of courage. Ali’s dedication to his work was not widely recognised. It seems that he hated the grind of training for a big fight, but nevertheless committed himself to the punishing regime. Hawking became the world’s foremost expert on astrophysics, describing black holes and dark matter. His book on these subjects was widely bought. It was said that hardly anyone managed to read it to the end. The quality of non-fiction for young readers has greatly improved in recent years. These two books, striking a tricky balance between accessibility and informative value, are evidence of that progress.